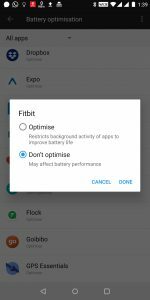 Using fitbit on Oneplus 5T | Tech and me. I could not change the clock theme from app. I could not connect watch with GPS on my phone for running. I could not enable call and sms notifications. After struggling a lot for a few days and browsing through for solutions I finally found one and it has been working really for more than 4 months for me now. This solution is not specific to just Oneplus 5T. This might work out on other android phones as well which are not officially supported by Fitbit. After upgrading to Android 9 fitbit sync has just stopped working. I haven’t been able to fix the issue.